Delacorso is an elegant, all-caps display font designed with luxury in mind. Inspiration comes from the many high end stores that line New York’s 5th Avenue. A tall cap height combined with broad strokes and hairline serifs produce a striking contrast. Beautiful curvature and softened edges creates a warm effect when viewed at larger sizes. The Outlined version makes use of negative space flowing through its stems. Use Delacorso for a luxury brand, magazine, titling, or fashion logo. 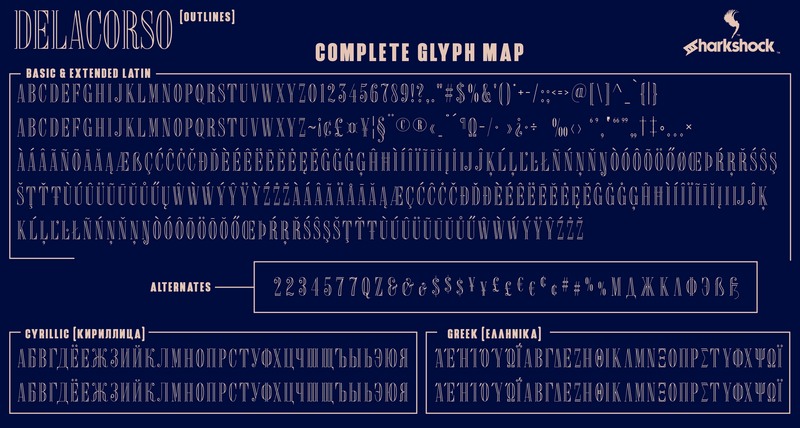 Basic Latin, Extended Latin, Cyrillic, Greek, punctuation, alternates, and kerning are included in the full version. 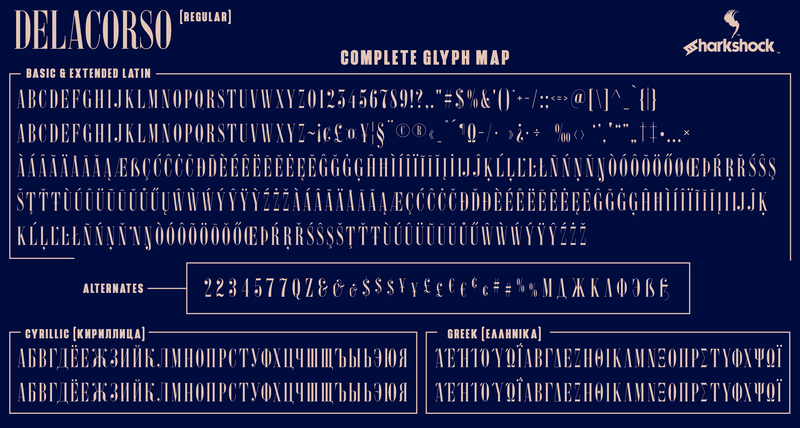 Please check the glyph map for all supported characters. The demo contains basic Latin and limited punctuation. The complete family with both versions is available at $40 for personal use only. This does NOT constitute a commercial license. For commercial licensing please visit http://www.sharkshock.net/license or send us an email. Commercial usage without a license is strictly prohibited and a violation of our terms and conditions as well as International copyright law. Visit http://www.sharkshock.net and take a bite out of boring design!